Perhaps one of the most frustrating experiences a vintage car buff can have is not being able to locate necessary parts. As you’ve worked on your “second love” Volkswagen, invariably you’ve run against the brick wall of “that part is no longer available”! “What??? Now what am I going to do?” That’s probably putting it mildly. In my more than 36 year experience with VWs, I’ve had this problem hundreds of times. My two children and I made a regular habit of visiting salvage yards in the late ‘70s and early ‘80s. Then, things changed. Government restrictions began making things difficult for the salvage people. Yards were moved or closed. But, don’t give up! 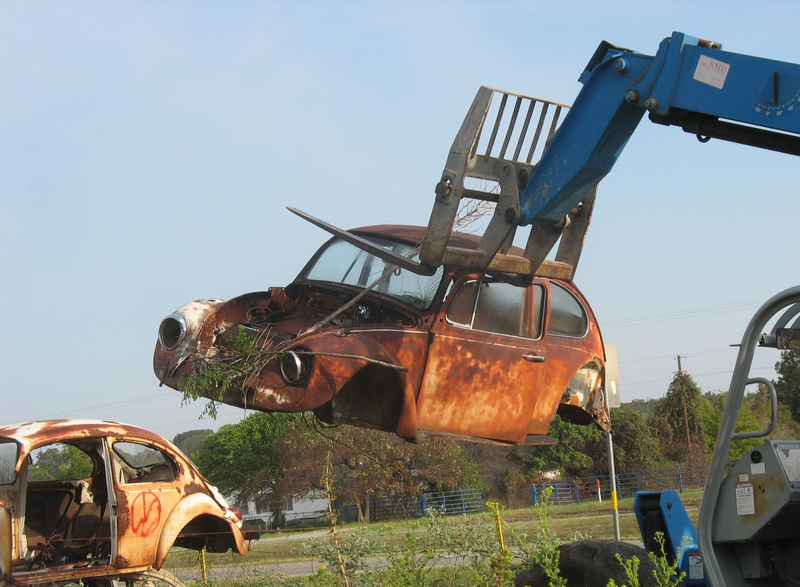 There still are some salvage yards located around the Country. 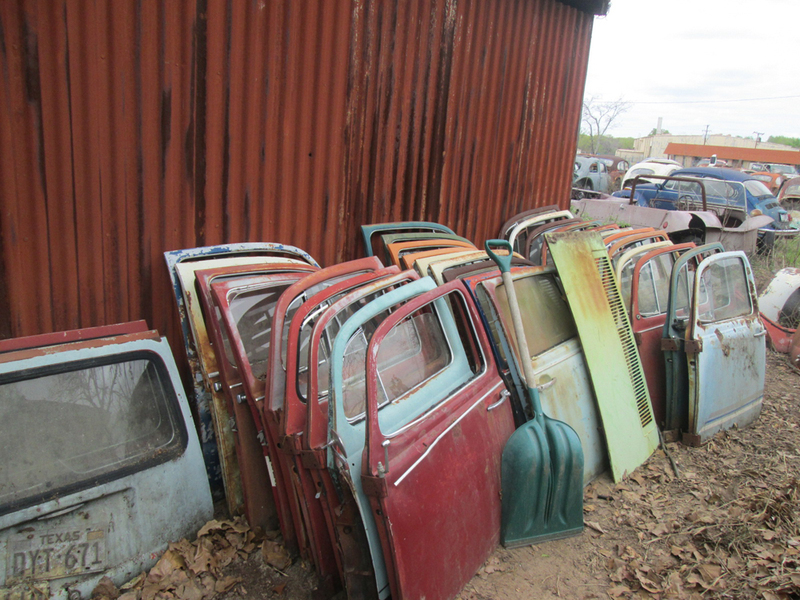 Here’s the unique story of one salvage yard oasis; Don’s Bug Barn. As told by Dustin Carter, Don’s son. How did you get all of this!?! I have answered this question many times. My answer of “It is my father’s 36 year collection” never seems to satisfy. Okay? But… but how did you get all this? I tell the story, which always elicits smiles, that since we are in Texas, it is not uncommon that our story begins with horse-trading. In 1974, my father, Don Carter, got his first Volkswagen from my grandfather, who traded a horse for a dune buggy. My grandfather had no use for the buggy and offered it to my father, who accepted, thus beginning the story of Don’s Bug Barn. Growing up, my father always was a car guy, and throughout the years he acquired all types of American iron and muscle cars. But Volkswagens became his ultimate love. Once my father started working on the buggy, he realized that it was missing the carburetor. In true Don Carter style, instead of purchasing one part, he bought a Volkswagen Beetle, complete with an engine, for the cost of the carburetor. From there, one Bug led to another, and another, and so on. His first Bug was a 1959 Semaphore Beetle, which we still own. He says he was drawn to the simple, yet sophisticated engineering of a VW. He also liked being able to work comfortably on the engine, while having the ability to pull and reinstall an engine by himself. It did not hurt that VWs also were an affordable hobby at that time. My father is a collector of things, and when he becomes interested in something, let’s just say he is hooked. To this day, when asked, he is not able to pinpoint the exact reason he built the Bug Barn; other than that he needed a place to work on his VWs. He purchased land from my grandmother, and the foundation for the main shop was poured in 1977, with the help of friends and family. It was also around this time that my father made his first appearances on the local VW racing scene. He had been involved with drag racing for years, so racing VWs was only natural. 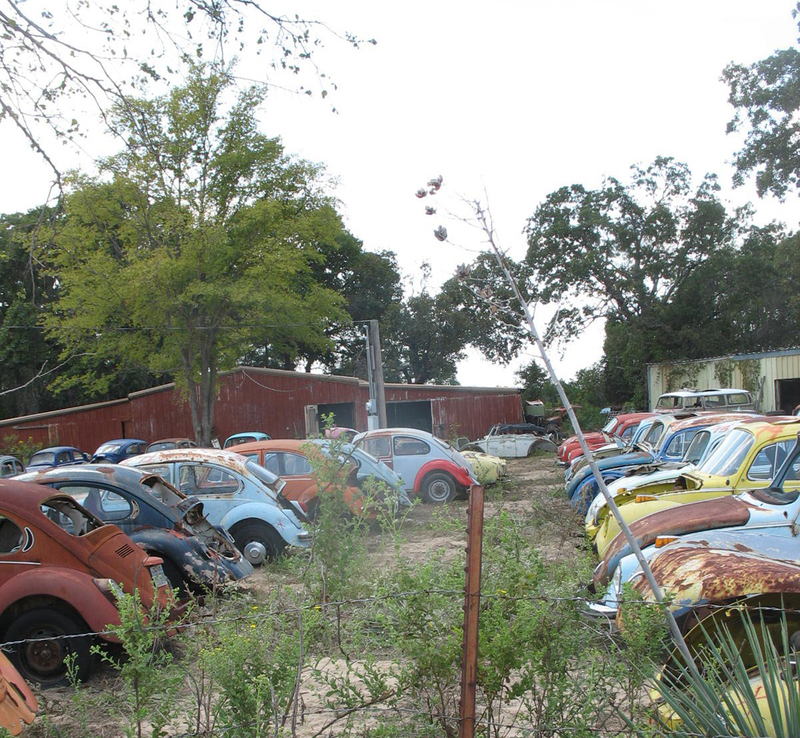 The Bug Barn owns two VW race cars, a ’61 Ghia and a “slightly” modified chop-top ’67 Beetle, both of which my father named “The Bad Habits.” His hopes were to run the Bug Barn as a repair/parts shop in order to fund his racing. With his shop operating full time, and weekends spent racing, my father was living his dream. When in 1979 he became a father, my grandmother and mother told him to “get a real job”. It was at this point that my father took a job with the State as a social worker. But that did not slow progress at the Bug Barn. Since my father’s weekdays were spent working at his “real” job, he hired people to run the Bug Barn for him. Through the ‘80s till the mid ‘90s, the Bug Barn flourished. Several excellent VW mechanics operated the business while my father was working. During this time, my father never stopped purchasing VW cars and parts. On the original Bug Barn business card it read: “I buy VWs any condition”. My father had the forethought to know that even a totaled VW still had good parts. He also realized the importance of one-year-only parts, which is why he regards the ’67 Beetle as the best year built. 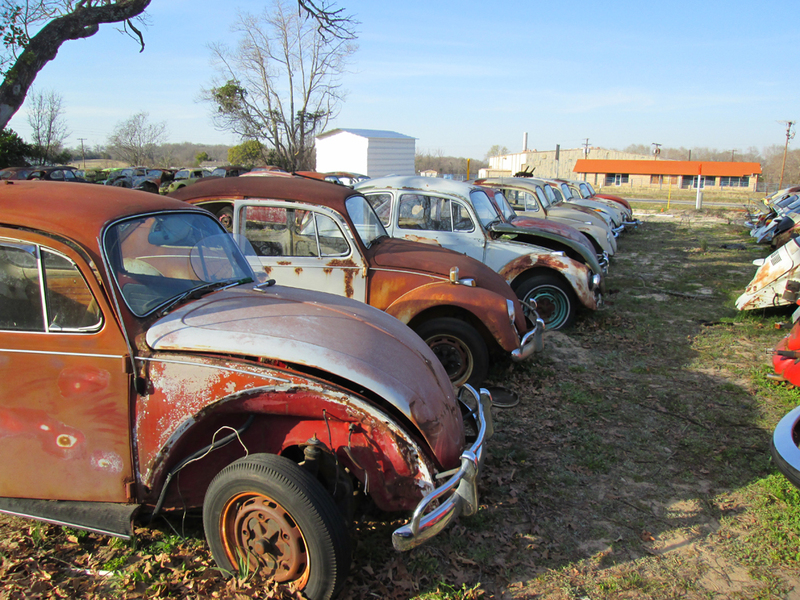 Over the years he bought several ’67 Bugs; we still have 15 of them today. Growing up, I did not know anything other than Volkswagens. Both of my parents drove Volkswagens, and on the weekends, if we were not buying VWs, we were camping in one or were at the races. My father’s hobby had turned into a successful business. However, the good times could not last forever. Around 1993-94, the Bug Barn lost one mechanic to cancer and another decided to return to college for a career change. This turned the shop back into a weekend-only operation. During this time business slowed. It was only my father and I running things, and with him working all week and me still in high school, neither of us had as much time as we would have liked to devote to the business. In 2002, when I left home to attend college in Louisiana, things stopped almost completely at the Bug Barn . At this point my father was retired, but his health was declining and his time spent on VWs became less and less. While he battled both throat and colon cancer, the hustle and bustle that used to occur at the Bug Barn stopped altogether. As my father was recovering, my grandmother became sick, putting him in the role of caregiver. I visited as often as I could, and every time I left town I would pass the Bug Barn, sitting there abandoned. It would make my heart sink. My life at this time, though, revolved around college and trying to establish my own career as a professional chef. Sadly, this kept me far from the Bug Barn. After graduating from college, I worked in several fine dining restaurants in New Orleans, and then moved to help open a restaurant in South Carolina. My grandmother’s health was poor, and the toll of taking care of her, combined with his own health issues, began to affect my father. Nothing was happening with the Bug Barn and each passing year saw more tree and brush growth overtaking the VWs. While I was in South Carolina my father was hospitalized with an awful case of pneumonia. I rushed back to Texas to be with him. After two weeks he finally was able to return home and I returned to my own life in South Carolina. Only a few months passed and he once again was admitted with pneumonia even worse than before. This time I was unable to leave work to be with him, which was extremely hard for me. I struggled with deciding what to do. With my dad’s health questionable at best, my grandmother’s prognosis not improving, and being my father’s only remaining family, I felt I had a responsibility. Not only did I want to be with my family, but there always was the question in the back of my mind of what should be done with the Bug Barn. My wife, Cassie, and I discussed moving back to Texas. The choice was ultimately decided when the chef I was working for sold the restaurant, giving us the perfect opportunity to move. With a U-Haul full of our belongings and three cats, Cassie and I returned to Texas in February, 2009. The original plan was that we would clean up the Bug Barn and sell everything within six months. Our time frame however was a little off. As we started the process we realized that it was going to take longer than just six months. The clean-up began with only a small tractor, but with 316 cars on two acres of land, the tractor proved inefficient. We quickly graduated to a backhoe and a forklift; overnight I became a heavy equipment operator. To organize, we had to keep shuffling cars from one spot to another to make them all fit. After many long hours and months of work we began to see progress, but at this point we still had not even opened the doors to the shop. Finally, with some order to the cars outside, we braved entering the shop and the two other buildings on the property. These buildings had not been used in over 14 years; they had been used to warehouse all of the engines, miscellaneous spare parts and the race cars. There literally was no walking room. They were full front to back with VW parts stacked everywhere imaginable. With the help of fellow VW enthusiasts and dear friends, Paul and Elaine Dill, after long hours and days of sorting and moving, we began seeing some small areas of organization take shape. To this day we are still trying to finish organizing, but we have come a long way since that first day. My plan never was to re-open the Bug Barn. In fact, I had no idea of the state of the classic Volkswagen market at the time I moved back. I was not sure if there was a need for parts or if the hobby was still alive-and-well in Texas. Boy was I in for an education! The classic Volkswagen World was indeed alive-and-well, and people needed original parts now more than ever. Unlike when my father started his business, I had the advantage of the web, craigslist, and more specifically, TheSamba became our salvation. Then word started to spread that something was happening at the “VW Bone Yard” in Athens, Texas. People had all sorts of stories about why it was being cleaned up. Several people came out in the beginning and offered condolences to me on the death of my father; others had stories of the property being sold and siblings fighting over the will. With each story, I just smiled and corrected them, telling them that my father was still alive and that I had no siblings to fight with, and that we were just cleaning things in order to sell cars. People were shocked that after so many years something was being done; cars were being moved and someone actually answered the phone when you called. It was at this point, with the growing curiosity of the place, and the looming task of continuing clean-up, that we decided to stay at least a year to finish things. That year became two, and then three, and here we are on year four, running a business we had no intention of starting. The demand for VW parts still amazes me. Now with the web, at least 40% of our customers are located outside the U.S. The first time we shipped parts to California, I laughed, because my dad used to order parts from California. Perhaps the biggest surprise for me came with our first shipment to Germany. Of all places, I never dreamed that our parts would be going back to their homeland. The VW community in the Dallas area has been very valuable to our business. Many people who had tried for years to come to the Bug Barn were eager to finally get the chance when we re-opened. Now locals can come to look around all day, and in Texas the term “local” covers anyone within 200 miles. 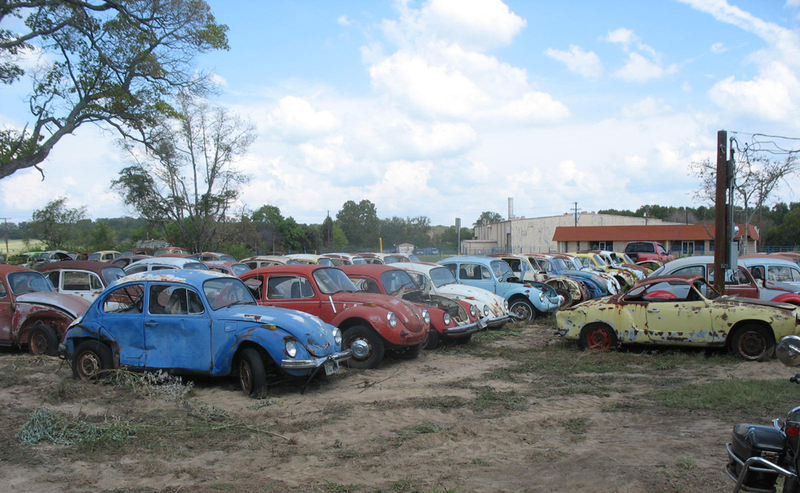 VW clubs enjoy planning day trips to come out to have a pick-and-pull. Groups from all over Texas and Louisiana have visited the Bug Barn. I try to stay active in the local VW community, and attend as many shows as possible. Without the help of fellow VW enthusiasts we would not be as successful as we are now. One such enthusiast who has been a great asset to our business is Jay Salser. Once Jay learned what we were doing at the Bug Barn, he championed our efforts and has become our honorary public relations representative. He has helped and supported us while also becoming a very dear friend. Another person who has aided us from the beginning is Larry Moore. Larry and my father have been friends for over 30 years. Mr. Moore is extremely knowledgeable when it comes to the Texas VW scene. In fact, Larry was the one who put us in touch with Jay. 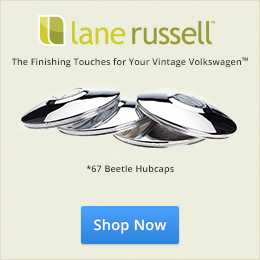 Thanks, Don’s Bug Barn, for sharing your story with 1967beetle.com. Kudos to you for sharing one of the best articles I’ve ever read on 1967beetle.com. You guys are really doing great things the VW world. Do you talk to the site owner, manager often? Any ideas in the works for a Samba like forum that is only for us ’67 enthusiast? Thanks for the comment and interest in 1967beetle.com. I’ve thought a lot about the forum idea. Setting one up isn’t hard, it’s moderation that becomes an issue. I’ve got my hands busy as is, trying to bring unique content with each article. We will see what happens in the future. Dustin worked hard on this article. It is difficult to compress such a lot of information into one short piece. It is my pleasure to have become friends with Dustin and Cassie. They are a valuable asset to the VW Community! My visits to the Bug Barn end in my having to be pried away. I always spend too much money–there are SO many treasures to “unearth” there. Yes, Eric and I e-message back and forth frequently. I always am amazed to see what Eric will craft next. We are seeing VW History in the making! As far as “forums”, we’ll have to see if this is in the offing for 1967Beetle.com. That would entail a lot of work to set-up and moderate and only Eric can answer that question. Excellent article! I enjoyed reading it and the pictures were awesome! Really neat to see a place like the “Bug Barn” still exists!! I haven’t made it to the Bug Barn yet but have purchased parts from there with help from Jay a couple of times. Thanks to them, my 72 super beetle has a hood and matching front seats. It’s about time for me to return some parts to the fold. I’ve got at least three and up to five rebuildable PICT 34 carbs, a generator, doghouse, fan and various other used parts I plan to get out to Don’s soon. Jay’s a great guy and a big reason this site has grown as much as it has. I’d give the Bug Barn a call. Their info is at the bottom of the article. Hello, Richard…First, thank you for patronizing 1967eetle.com! The first thing that I see each Monday morning is this wonderful Site! Put in a call to Dustin at the Bug Barn to see if he has an 1800 engine, or something in that size neighborhood. Anything is possible, although most of the engines that they have probably are going to be stockers. Be patient. Dustin and his wife are very busy people. They usually do not answer the phones during the day because of this. They do computer and phone work in the evenings as a general rule. When you go, be sure to take a list of parts which you need. This will facilitate pickin’-an-pullin’. Once again, you prove to us how amazing you are! That is cool to see all the beetles. I love vdubs. I have a 1973 and 1971 both sedans. I am thinking of restoring the 1973 but I also want a 1962-1966 convertible. I have had both cars for about ten years maybe longer. I wish all vdubs could be restored. They are truly a classic. Wow, Jon! Your visit has to be THE record! If Dustin and Cassie didn’t have their hands so full already, I’d suggest that they have a registry book for recording every visit. There’d be some stories–like yours–that would be good reading. You are exactly right about the Carters–we enjoy their visits. Dustin and I often “burn up the phone line” late at night, talking about VWs. Cassie and my wife enjoy talking when they come to Garland to deliver parts. I am glad to hear that your daughter restores Volkswagens. I call it “resurrecting”. Getting these cars into good, driving condition is my passion–and, I see from the readership at 1967Beetle.com, that this passion is shared by many, many others. Thanks for letting us know about your visit to the Bug Barn, Jon. Thanks for the comment. Jay will reach out to you directly. 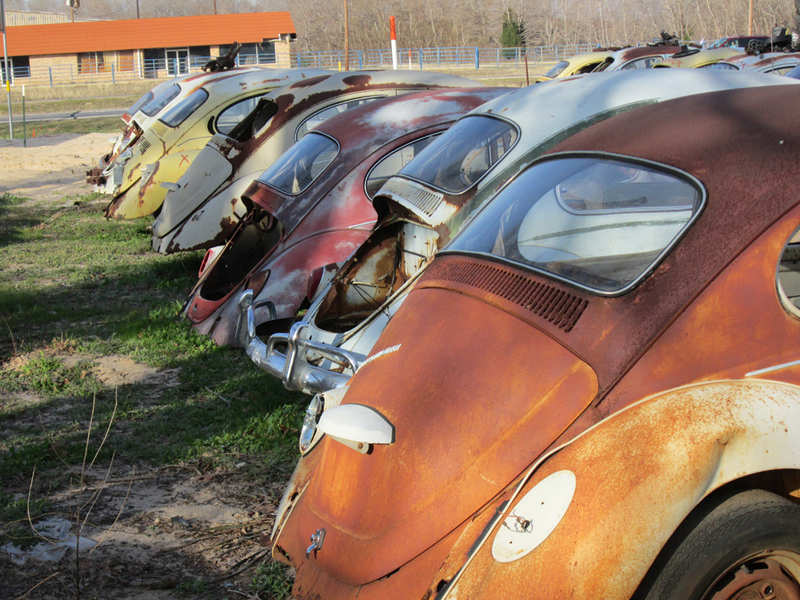 I so want to buy an old bug….wonder if they have any for sale. It’s mostly a parts yard, but they do have some complete VWs. I’ll follow up via email. thanks for the email….nice car! 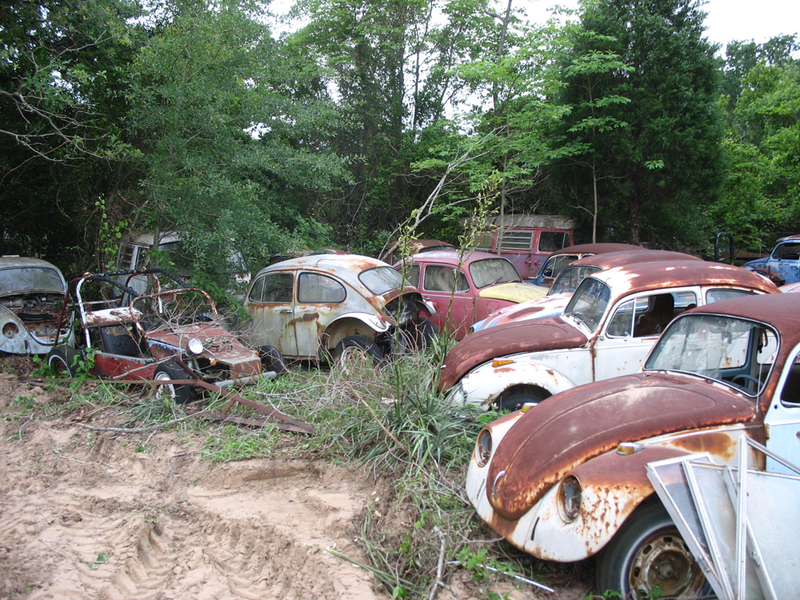 want to see if Don’s Bug Barn has something for me to buy to fix up….you know of any?? What year are you looking for? Are you in Texas? You should connect with Jay Salser. I’ll write you now and connect you with Jay. ’63 is a good year! Thanks Eric for all the help! Jay might be able to help. Any chance you have connections in AZ (the Tucson area)? I’m looking for a project car but TX is a little out of my travel distance. Great article btw. I’ve FWD your comment to Jay Salser. Let’s see if he has a source. Chirco is a VW oriented Parts House. They know VWs and they know the area. Count the costs of your proposed project, then gather your funds so that you will have a successful outcome. Reject “haste” and play it cool and you and your completed project will be the talk of your VW meetings! Hopefully, Don’s Bug Barn will have your radio. I hope that you find a radio. I do! Try Bobby at Advanced VW. I need a dash bored for my super beetle 1973 clean with out creaks ? Wonderful story of reclaiming a passion. Looking for a VW Beetle for project can be between 55 to 63, I live in Orlando area. Do you have any leads on this side of town? I’d give our classified section a look. Thanks for the quick response Jay….I will follow up on your leads. 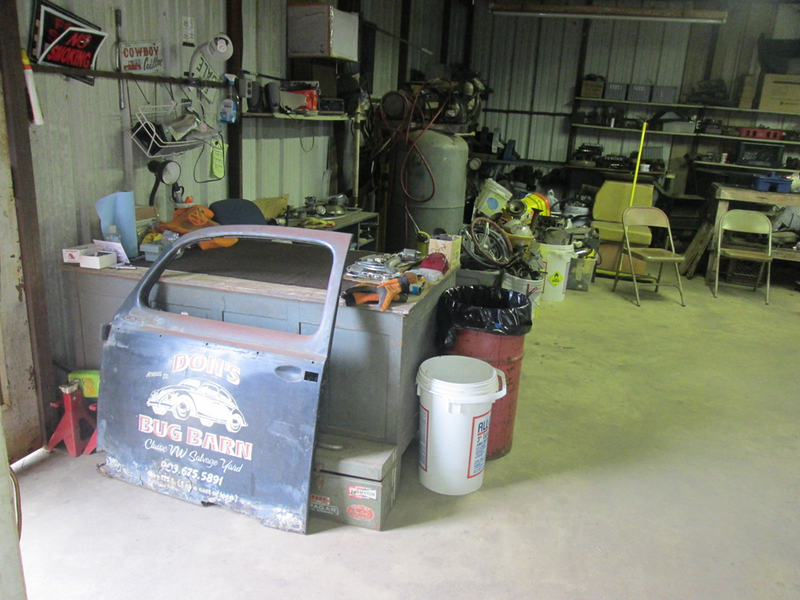 Love the story of Dons bug barn,now have a new source of parts ! The 67 was my favorite year as well. Now I’m restoring a 69 beetle, which I purchased from a storage unit in parts. They cut out the roof for a rag top, but the aftermarket kit is fiberglass. We decided not to put the kit in the car, but that leaves us with a dilema. We would like to have either a factory sun roof or just leave it as a regular roof. We need a complete roof to weld a new top for the 69. Any ideas? Hi Eric. I’m in Atlanta, GA area. You? We are in Austin, TX…. But I’m From Atlanta, GA. Small world! Hello, I was thinking on stopping by this weekend do you know what time you will be opened. Hello,is ther a salvege yard,bone yard or a grave yard in Atlanta,Gorgia please help…..
Hello! I was hoping someone would be able to help me find a classic beetle for an art piece..
My wife and I own a mexi/carib restaurant and want to Cut it in half and mount it on the wall in our restaurant with some really cool painting on the car.. Help me help me!! I inherited an piece of property from my father and it has an old VW bug sitting on it, rusted and not running. The engine is sitting on the ground. It’s probably at 62. Just a guess. All I want is someone to come get it. I’m located about halfway between San Antonio and Houston. Thoughts? I wish I was still living in Austin, so I could pop up there one weekend! I believe I still hold the record for the biggest distance travelled for a visitor to the ‘Bug Barn’. Dustin and Cassie made my cousin and I so welcome, it was a wonderful time. Oh! Where did I come from ….Ipswich England. Not that I have found Jay, we have some great suppliers in the UK like VW Heritage and Just Kampers, there is just not the land available for storage here! Where can I find a rust free 1964 body shell if possible? good morning Jay. I am lookin to swap the entire metal dash of my 72 ghia coupe with a 1963 or earlier complete metal dash assy. The dash would be removed from a wrecked/junked donor car and welded into my 72. Do you have anything in your inventory that you might part with? 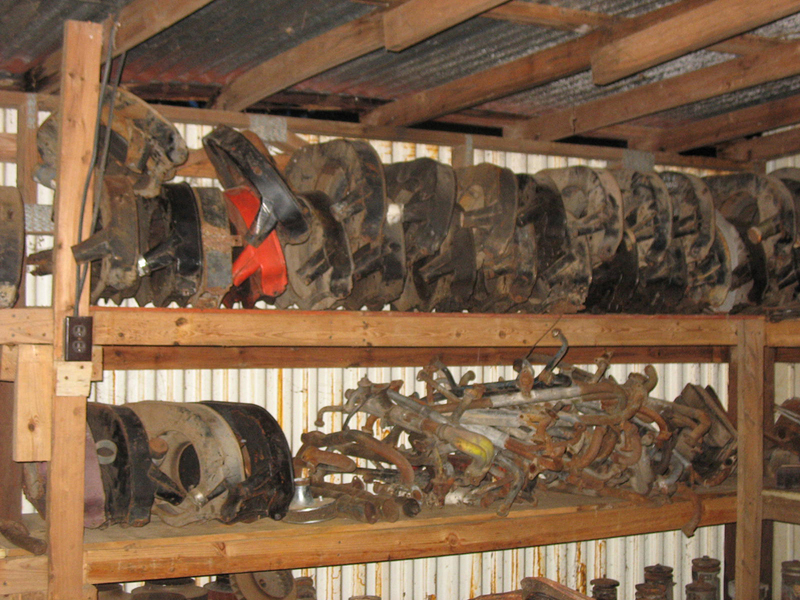 We need parts for a 1967 VW Bug rebuild. the engine lid license plate holder and light assembly, two seats, four steel wheels and hub caps and the wiper motor assy. Please e mail me if you have these parts. My wife and i have been to your place two times. I sent you an email directly. Happy to help. Hi I am looking for a front half shift rod for a 1970 VW campmobile. of all the things to go wrong my sons is rotted out. Cant drive what we cant shift. Please let me know if you have such. I have a 1970 VW Bug. In very nice condition. Has been in the family since my mom in law purchased it new. Garaged kept. Wonder what it would be worth? Love seeing all the VWs. Hello… I’m looking for a 67 an under bug to restore. If u have one please let me know. Thank you. Jerry. I m in the Mandeville la area and am looking to return my 1973 super beetle to original r stock ride height . Maybe want the strut housings and all related parts to put back on ? No one seems to want to let u know how to lift a bug back up once it’s lowered!!!! Can u help me please ???? Hello great website, I am looking for the chrome which goes around the side rear windows for a 67 Beetle I am restoring. Hello, guys, we’re looking for an upper hinge pillar for a 1968 bug. Hello all. I am looking for someone who does restoration in the Dallas area…more so North Dallas/Plano. I have our 1967 Beetle that my father bought new in 67′ and is in good shape with 89k miles on it. It has factory a/c and has been garage kept for the past 23 years. It hasn’t been started in about 5 years which was the last time it was driven. I was wanting to return it to as close to new as possible. Thank you very much. I’m looking for both front seats for a 1958 VW beetle.